MKAA's Phil Oxley, Gary Maton and Mike Reveler, with 'Supa Carp' supplier Lee and a small sample of the fish which went into Furzton, Monday. Thousands of pounds worth of fast-growing young ‘Supa Carp’ are now swimming around in Furzton and Caldecotte following Monday’s MKAA stocking. 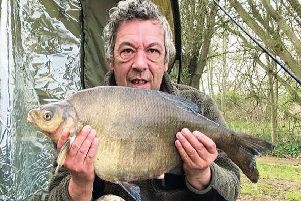 The fish – the same strain which has been doing so well in Willen and Caldecotte lakes – are part of this year’s planned £10,000 injection to boost future sport in a number of city lakes. Monday’s Furzton consignment included a batch of 1lb to 3lb commons, mirrors and ‘fully-scaled mirrors’ plus a similar mix of 1,000 six-to-eight inch fish; with more than a thousand 6 to 8 inchers also added to Caldecotte. Other fish in the 1 to 3lb class have been earmarked for a water where they can be fished for while ‘growing on’ and – when they hopefully hit double figures – moved out to other Parks Trust-controlled waters in the city area, with more ‘tiddlers’ brought in to replace them. Some stillwater chub could also be on the agenda, depending on availability. >> Lady Luck smiled on Stuart Cowling this week when he won the raffle (to guess how many pellets were in a pint pot) run to mark the third anniversary of MKAA’s Facebook page. He wins a £50 voucher donated by Tackle Hub and a three rod 2016/17 MKAA season ticket. >> Tove Valley open, Lakeside: Richard Latimer 68-8, Darren Pannell 55-2, Pete Gibson 52-12. >> Mill Farm open: Paul Abbott 15lb (silverfish), Steve Wright 13-10, Steve Chilton 13lb. >> Towcester Vets, Cosgrove canal: Graham Martin 12-13 (skimmers), Terry Robinson 8-8, John Balhatchet 6-10. >> Towcester, Wappenham Water: George Mynard 12-5, Bas Eaton 10-8, George Cooke 8-4. >> MK Vets, Manor Fields canal: Kevin Osborne (breaking a run of blanks) 5-8, Martin Cunniffe 4-13, Steve Dzialak 3-15. >> Linford, canal, Wharf section: Ron Dorrill 8-2 (inc a 4-6 tench), Mick Hefferon 4-4 (inc a 1-4 roach), Roy Hefferon 3-2. >> Fixtures: May 15, Mill Farm open, 07854 649279; May 26, 27, 28 – Furzton CLOSED for fishing to accommodate national model-boat competition.